Americas gateway to the universe. Leading the world in preparing and launching missions to Earth and beyond. 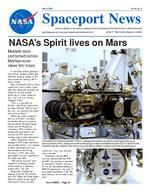 Jan.16, 2004John F. Kennedy Space Center Spaceport Newshttp://www-pao.ksc.nasa.gov/kscpao/snews/snewstoc.htm Vol. 43, No. 2(See SPIRIT, Page 2) NASA's Spirit lives on MarsTHE MARS EXPLORA TION ROVER "SPIRIT" underwent final checkout last March at the Payload Hazardous Servicing Facility at KSC. A plaque mounted on the high-gain antenna commemorating the STS-107 Space Shuttle Columbia crew was installed on the rover during the procedure. Below, a closeup view of the Columbia plaque.A traveling robotic geologist from NASA landed on Mars and returned stunning images of the area around the landing site in Gusev Crater. Mars Exploration Rover Spirit successfully sent a radio signal after the spacecraft bounced and rolled for several minutes following its initial impact on Jan. 2 at 11:35 p.m. Eastern Standard Time. This is a big night for NASA, said NASA Administrator Sean OKeefe. Were back. I am very, very proud of this team, and were on Mars. While the world waited for the first of NASAs two Mars Exploration Rovers to land on the red planet, Kennedy Space Center and Jet Propulsion Laboratory (JPL) workers who helped plan and process the missions at KSC were also waiting with excited anticipation. Sheryl Bergstrom, NASA manager of JPL Cape Operations and resident office, is no stranger to Mars exploration missions. She worked on the Viking missions in 1975, and subsequent Mars missions launched in the 1990s and 2001. The earlier missions were limited to collecting samples within reach of a stationary robotic arm, she said. Bergstrom watched the landing on NASA TV at home and said, When the Deep Space Network picked up the signal from Spirit, I knew we wereMultiple tests performed before Martian rover takes first stepssuccessful. I was very relieved and overjoyed. Bergstrom said the MER missions demonstrate that KSC and JPL are working as one team to accomplish NASAs mission. As for the anticipated landing of MER-B Opportunity, she said, I have great confidence in the JPL team and now all we need is lady luck. SPACEPORT NEWS Jan. 16, 2004 Page 2 Awards The Kennedy UpdateJim Kennedy Center Director Greetings, everyone! The Spirit of our nation and this great Agency now lives on Mars. Our knowledge of the universe dramatically changed forever Jan. 3, and we can say, not only were we alive for this lifealtering event, but KSC helped make it happen. Everyone saw the unbridled euphoria which broke out in the seconds after Spirit landed safe and sound and radioed home. The pictures it sent in the hours following were remarkable. Im extremely proud of the Jet Propulsion Laboratory team for their tremendous accomplishments, and I know we all wish them the best of luck for the landing of Opportunity Jan. 25. Im equally proud of our own expendable launch vehicle team that ensured Spirit and Opportunity rocketed safely into space last summer. Then, it was our turn to cheer as the rovers streaked into the Florida sky for their more than 100-million-mile journey. Simply put, Spirits successful landing couldnt have taken place without the professional skill and expertise displayed by the entire KSC launch team last summer. Whether NASA or contractor employee, it doesnt matter. You should feel proud of your accomplishments and the role you played. Believe me, from the more than 220 million hits on NASA Web sites in the 48 hours after the landing, the world is excited about your work and people truly care about the space program. It may not show every day, but with events like this, we are reminded that programs like our rovers, the Space Shuttles, and International Space Station arent just NASA programs, but more importantly, they belong to the American public and they take pride in our accomplishments. I cant wait for Opportunitys landing to experience it all again! Now for some news back here on Earth. Over the holidays, while many of us were enjoying a break, more than 300 United Space Alliance employees continued processing work on the orbiters. The majority of the work was performed on Discovery, where many crucial milestones were achieved on our critical path to return to flight. Technicians accomplished an enormous amount of work, including beginning to replace the Rudder Speed Brake actuator bushings, installating a cold plate and successfully bonding approximately 50 tiles as planned. Their measure twice, cut once approach to accomplishing these critical milestones during the holidays demonstrates the dedication of our workforce in returning our Space Shuttles safely to flight. I couldnt be prouder of our team. Coinciding with the excitement of the Mars landings, Im reminded we are approaching a very sacred time at the end of the month with the anniversaries of the Apollo 1, Challenger and Columbia tragedies. Well never forget our fallen heroes and Id like to relay some events taking place to mark the one-year anniversary of the Columbia accident. On Feb. 1, a short wreath laying ceremony is planned at the National Space Memorial Mirror at the Visitors Complex beginning at 9 a.m. Any employee with a badge and family members are welcome to join myself and Dr. Steve Feldman, chairman for the Astronaut Memorial Foundation, at the occasion. Later that evening, the NFL is paying tribute to the crew during Super Bowl activities broadcast on CBS. The next day, a special Columbia memorial ceremony from Arlington Cemetery, set for 2 p.m., will be carried live on NASA TV. I invite everyone to tune in to what should be a touching and moving event. While we celebrate the success of Spirits landing, its only fitting we take a moment to pay tribute to those who helped blaze this path of success into the future. Im humbled by their accomplishments and treasure their memories. Finally, thanks to everyone who joined in the Martin Luther King Jr. celebration yesterday in the Training Auditorium. It was a first class event. Have a great weekend and enjoy the MLK holiday.Spirit . .(Continued from Page 1)Albert Sierra, a NASA-KSC mission integration manager, spent three years working on both MER missions. I stayed up late waiting for the landing, Sierra said. At first I was very nervous, but then it changed to being very excited. When Spirit landed successfully on Mars and began sending pictures back almost immediately, Sierra was proud to be a part of it. Since Jan. 3, he has received numerous e-mails from family and friends. Sierra hopes these missions will help spark younger generations to consider space exploration and research careers. Something about the red planet sparks an interest in all of us. Tricia Fertig, a NASA-KSC mechanical systems engineer for Spirit, also worked on the Mars missions in 1998. I was holding my breath for this one, Fertig said. After the landing? It was absolute excitement. The feeling is indescribable, said Fertig. Part of Fertigs responsibilities required her to travel to JPL to make sure the Mars rovers would integrate properly to the launch vehicle payload adapter. Fertig commented, The science benefits are tremendous for the future. Elation and relief is how James Behling, NASA-KSC MER A and B integration engineer, described his reaction. I also yelled out big yeses! with an arm shuffle, said a grinning Behling. I was surprised at how quick the pictures came down. Spirit severed its final connection with the lander platform by firing a cable cutter and will now head northwest. The nation will then look ahead to the second landing, MER-B Opportunity, scheduled for Jan. 25. This image was taken by the front hazard avoidance camera on the Mars Exploration Rover Spirit. SPACEPORT NEWS Page 3 Jan. 16, 2004Shuttle Processings Pete Nickolenko devotes the same dedication to Kennedy Space Center as he provides to his family, prompting his recognition as a 2003 Employee of the Year. I mostly enjoy spending quality family time with my wife and two children, he said, referring to his wife Becki, daughter Lisa, 13, and son Jack, 5. Nickolenko, who also enjoys golfing and fishing, works in the Shuttle Launch and Landing Office as a lead NASA test director. His regular duties include planning, developing and executing launch countdowns. Its probably one of the best jobs at KSC, said Nickolenko. I work with an outstanding group of people in leading the Shuttle launch countdown. Nickolenko supported the STS-107 investigation, and nowShuttle team selects Nickolenko as its 2003 bestintends to continue contributing to Return to Flight (RTF) tasks, including Mission Management Team support and training, and serving as KSCs technical liaison to the Stafford-Covey RTF task group. I was the KSC contact for data impoundment and release, he explains. A small team of NASA and contractor folks and I were responsible for collecting and protecting all the data related to STS-107 mission processing and the investigation, and controlling release of that data. Nickolenko is humbled by the employee of the year award. There is such a great team of professionals here at KSC and in Shuttle Processing, and especially this year, which has been so difficult for many of us supporting the Columbia investi gation. His loved ones provide him with motivation today and, in the past, inspired his career path, which began at KSC following the Challenger accident. My family moved to Titusville in the early 1970s, said Nickolenko. I remember watching the last few Apollo launches from across the river and thinking that I wanted to be an astronaut. Several years later, after I got married, I asked a family friend if he knew whether NASA had any job openings. I accepted a position as a vehicle operations engineer and have been working in some capacity of Shuttle operations ever since.SHUTTLE PROCESSING'S PETE NICKOLENKO, whose regular duties include planning, developing and executing launch countdowns. He was also named his directorate's employee of the year.The Solid Rocket Booster Element (SRBE) design team recently had extra reason to celebrate during the holidays. Gabriele Gabby Sikinger, born in Nurnberg, Germany, has lived in America since 1992 and received her American citizenship this past November. When asked how she felt that day, she said, Im proud to be an American and was excited to share the experience with 200 other people from 49 different nations. Gabby, a drafting lead and seven-year member of SRBE design services, finds it hard to believe she is working for NASA, something she could only dream of as a child. For her it is an honor. Growing up in Germany she remembers being fascinated by Ulf Merbold, the first German astronaut to fly aboard Columbia, in 1983, and the other German astronauts who flew in the 1980s and 90s.SRBE design's Sikinger proud to be an American NASA DEPUTY ASSOCIATE ADMINISTRATOR for Space Station and Shuttle Programs Michael Kostelnik (left) and NASA Space Shuttle Program Manager William Parsons each don an Emergency Life Support Apparatus (ELSA) during training on the proper use of the escape devices. NASA management was at KSC to participate in a leadership workday to provide management with an in-depth, hands-on look at Shuttle processing activities.NASA managers train at KSCGabby and the Computer Aided Design (CAD) operators in her group have organized a CAD Users Group to provide information and education to SRBE CAD users. The group meets once a month to provide tutorials and to answer questions about using MicroStation software. Call 8677682 for information.GABRIELE "GABBY" SIKINGER received her American citizenship in November. Page 4 SPACEPORT NEWS Jan. 16, 2004 How often have you said you would like to be a fly on the wall somewhere to get more information? The complex eyes of flies have many individual facets, each representing a separate light-detecting unit, and humans can only approach that capability through multiple cameras. For NASA, the more eyes the better. When the Space Shuttle launches again, more cameras will be examining its ascent than ever before. The reason is a major improvement in the tracking and imaging capabilities at Kennedy Space Center, primarily through additional cameras and digital resolution, as recommended* by the Columbia Accident Investigation Board in its report released in July 2003. Cameras at KSC are sited for short-range tracking (T-10 through T+57 seconds), medium-range (T-7 through T+110 seconds), and long-range (T-7 through T+165 seconds). Around the launch pad, cameras focus on the external tank, solid rocket boosters and orbiter. For several miles up and down the coast, tracking cameras and longrange optical tracking systems capture ascent imagery. Previously, four short-range tracking cameras were used at the launch pads, on camera sites two (east side) and six (northwest). They are remote controlled from the Launch Control Center. Since it is such a tight shot, one camera is focused on the top half of the Shuttle and one focused on the bottom half. Cameras also view the hydrogen vent arm (above the external tank) and the underside of the orbiters left wing, the one facing the camera. Other cameras view the area between the orbiter and the external tank to see any debris or ice that might form. For return to flight, two new camera positions have been proposed to the northeast of the pad. The addition of this tracker ensures a view of the underside of the right wing and the area between the external tank and the orbiter to view any debris during its roll maneuver. The pad cameras have 200 mm (focal length) lenses, running 100 frames per second (fps). Each camera is loaded with 400 feet of film. In addition to the video cameras around the launch pads are 42 fixed cameras with 16 mm motion picture film. Medium-range trackers have been located at five sites, four along the coast and one near the Shuttle Landing Facility. Additional trackers are proposed at sites 2.25 miles and 3 miles north and west of the launch pads, for a total of seven. Placement at these sites will provide three views for triangulation, to better capture multiple views of the Shuttle during launch. These cameras have 800 mm (32-inch) and greater lenses (80-inch and 120-inch), running 100 fps. Three of the cameras have 400 feet of film; two of the cameras have 1,000 feet. The additional tracking cameras have 150-inch lenses, with 1,000 feet of film. Five long-range trackers have existed north and south of the pads, ranging 14 miles north of the launch pads to Shiloh and Playalinda Beach, to 20 miles south at Patrick Air Force Base. One of the cameras previously sited at Patrick AFB, deemed too far south, has been dropped in lieu of an Advanced Transportable Optical Tracking System (ATOTS) on north Merritt Island. The proposed five additions will reach as far north as Ponce Inlet, 38 miles from the pads, and south to Complex 46 on Cape Canaveral, 11 miles from the pads. All the cameras will have 400-inch focal length and 100 fps capability to provide more data points to better track the Shuttle as it climbs to orbit. Two of the cameras are part of the Distant Object Attitude Measurement System (DOAMS), located at Playalinda Beach and Cocoa Beach. A refurbished 10-meter focal length telescope was recently reinstalled in the Cocoa Beach DOAMS. A unique feature of the tracking telescope on Playalinda Beach, north of the launch pads on Cape Canaveral National Seashore, is aInnovative technology to cap t robotic camera manned by a technician sitting on top and gently manipulating a joystick to map the Shuttles trek through the sky. The joystick is so sensitive, it even responds to the heartbeat of the person using it, explains Bob Page, chairman of the NASA Intercenter Photo Working Group. There are two lenses stacked vertically. The top is a 400-inch lens for 35 mm film. The bottom is a 200-inch lens for video. Improvement planned in backup imagery is a change from the standard analog video camera (640 x 480 resolution at 30 fps interlaced) to a digital high definition camera (1280 x 720 resolution at 60 fps progressive). Studies are under way as well to upgrade film cameras to highspeed digital cameras. *Recommendation R3.4-1: Upgrade the imaging system to be capable of providing a minimum of three useful views of the Space Shuttle from liftoff to at least solid rocket booster separation, along any expected ascent azimuth. Page 5 SPACEPORT NEWS Jan. 16, 2004 t ure Shuttle launch imagesIN COCOA BEACH, a new fivemeter telescope (left) is lowered toward the dome for installation.The tracking telescope is part of the Distant Object Attitude Measurement System (DOAMS) that provides optical support for launches from KSC and Cape Canaveral. At the launch pad perimeter camera site at Launch Complex 39B (above), news media are briefed on the improved tracking cameras that will be used to capture ascent imagery during the return to flight of the Space Shuttle. Inside the dome is a tracking telescope (right) that provides optical support for launches. Below, a worker calibrates the thermolite level on a newly installed five-meter focal length telescope. Jan. 16, 2004 SPACEPORT NEWS Page 6Space Station processing in high gear for return to flightShuttle tool for payloads earns KSC team national honorsPrecise 3-D modeling and real-time simulation were brought together to create an innovative new way of analyzing payloads before they are installed on the Shuttle. The NASA/Boeing Launch Services Simulation Laboratory team developed the tool, which will allow technicians to analyze science payloads and International Space Station (ISS) Orbital Replacement Units for horizontal or vertical installation. The National Training Systems Association recognized the work as 2002s best simulation to analysis. The team was formally honored during Decembers Interservice/Industry Training, Simulation and Education Conference. Maria LopezTellado accepted the award for the team that also includes Boeings Robert Humeniuk, Brenda DiSanto, Mia Little, Richard Bard, T.C. Ma, Robert Edwards and KSCs Michael Conroy. Interim IT Director Bruce Hevey and Launch Services Manager Stephen Francois represented KSC management at the ceremony. This approach was first implemented during ISSs first utilization flight (UF-1). NASA and Boeing modelers, along with many other experts, collaborated in developing ground processes that satisfied ISS ORU processing requirements. Simulation increases consensus because everyone can see how everything fits together, where there are problems and how a process will work, said Conroy, a technical advisor. That shared experience makes it more likely that people can reach agreement on a course of action. The team also used Computer-Aided Design (CAD) to construct precise models of the payload bay and other areas. As NASA prepares for Return to Flight, technicians at Kennedy Space Centers Space Station Processing Facility (SSPF) are really hopping. Most International Space Station (ISS) payloads are processed in the SSPF, so theres always plenty to do. Right now, there are four major Space Station elements that are being assembled and tested for upcoming Shuttle missions, including return-to-flight mission STS-114. The emphasis is on partnership in everything we do here at Kennedy Space Center and how we work as a team to get the job done, said Bill Dowdell, director of Technical Operations at the SSPF. Work is proceeding at a steady pace in the Space Station Processing Facility. Two major components being processed by the SSPF technicians are the 12A and 13A element power modules that include solar arrays. These additional arrays will be installed and deployed on the ISS to deliver the extra power required to conduct greater scientific research. Processing of the elements is very close to completion. The batteries that were installed prior to the solar arrays as part of the initial design phase need to be tested because of the grounding of the Space Shuttle. Consider the batteries we have at home. We know that if theyre stored in the refrigerator, their shelf life is increased. The element batteries were also kept in a refrigerated unit. But once they were installed on the module, their operational life clock began ticking and their charging capability was diminished. Testing will have to be done to see how much battery capacity has been lost. Depending on the results, a decision could be made to disassemble the modules and replace the batteries. Japanese Aerospace Exploration Agency (JAXA) technicians are working on another component, the Japanese Experiment Module (JEM), a research facility similar to the U.S. lab. They plan to complete their stand-alone testing and final assembly work by the beginning of March 2004. JEM will remain in the SSPF until called to duty on a future launch. U.S. Node 2, the element of the Station that will signal Core Complete when installed on orbit, is in its final assembly and servicing stage. This crucial testing stage will show if there are any problems that might need to be addressed. Testing of the common berthing mechanism on the Node 2 is scheduled to pick up soon. These are connection tests to verify that the module joins the Space Station in such a way that it will grapple, dock and seal properly. Node 2 will also undergo an element leak test. After transporting the element to the nearby Operations and Checkout Building, it will be put into a vacuum chamber. The air will be pumped out of the chamber, to simulate a vacuum much like in space, and the module will be checked for leaks. All human habitation modules are tested in this way. The daily flurry of activity that goes on in the SSPF not only includes assembly and test of the truss cargo segments and Node 2, but preparation of the MultiPurpose Logistics Modules (MPLMs), as well. The first two MPLMs, Leonardo and Raffaello, have already flown and are back in the SSPF to prepare for future missions. These modules are used for transporting science experiments and cargo to and from the ISS. Technicians are vigorously working to prepare Donatello, third in the series of MPLMs, for risk mitigation testing that will prepare it to fly as the first powered MPLM. In this case, powered means the module will supply electricity and cooling to the science experiments that it is transporting. Donatello is being processed by NASA with engineering support from the Italian Space Agency and The Boeing Co. MPLM testing will begin in late winter or early spring. Even after construction of the ISS is completed, Space Station processing at Kennedy will continue. MPLMs Leonardo, Raffaello and Donatello will need to go through the processing cycle again to prepare for their next missions. There is more than enough work to keep those SSPF technicians hopping in their bunny suits for years to come. THE SPACE STATION PROCESSING FACILITY high bay currently houses four major Space Station elements, including power modules that will deliver extra power required to conduct greater scientific research. Page 8 SPACEPORT NEWS Jan. 16, 2004 John F. Kennedy Space Center Managing editor. . . . . . . . . . . . . . . . . . . Bruce Buckingham Editor. . . . . . . . . . . . . . . . . . . . . . . . . Jeff Stuckey Editorial support provided by InDyne, Inc. Writers Group. NASA at KSC is located on the Internet at http://www.ksc.nasa.gov USGPO: 733-133/600048Spaceport News Spaceport News is an official publication of the Kennedy Space Center and is published on alternate Fridays by External Relations and Business Development in the interest of KSC civil service and contractor employees. Contributions are welcome and should be submitted two weeks before publication to the Media Services Branch, XA-E1. E-mail submissions can be sent to Jeffery.Stuckey-1@ksc.nasa.govComprehensive Health Services recently announced that Charles Smallwood, M.D., will replace Paul Humbert, M.D., as the Joint Base Operations Support Contract (J-BOSC) medical director. Leon Skip Beeler, M.D., was also appointed deputy medical director. Occupational Medicine and Environmental Health Services has the fortune of employing some of the most professional, personable people of which Ive encountered in my career, said Dr. Smallwood. Some of my goals are to provide the management environment to allow each employee the ability to improve their own health and safety practices, encourage personal advancement and share in the accomplishments of our integrated team. Dr. Humbert is retiring and has enjoyed working with the J-BOSC team for the past five years and with the Spaceport team for more than 17 years.Medical staff announces personnel changesThose walking into the Visitor Complex Jan. 7 at lunchtime probably thought a professional drum corps was performing an upbeat concert on the Astronaut Encounter Stage. Once encountering the performance, the visitors realized the drum group were children ranging in age from 7 to 12 years old. The group, Aisen Warabe Taiko, was appearing by virtue of the Performance Group Program, a new Visitor Complex initiative. They made the visit to celebrate the lives of the Columbia STS-107 astronauts. The 14 members began their training at the age of three at the Mitsumi Aisen Kindergarten, whose proprietor, Mustumi Ogura, accompanied the group. According to Mustumi, the program may appear to be focused on music, but it is more about the inner spirit and how toYouth remember Columbia astronautsbe a human being. She describes the philosophy as, the drum sounds created by each of the children during a performance are an inside-out expression of their humanness and the wish they make to give others happiness and peace of mind through their performance.THESE 7TO 12-YEAR-OLDS from Japan, who began training on these drums at the age of 3, perform a tribute to the Columbia STS-107 astronauts on the Astronaut Encournter Stage at the Visitor Complex. A NEW WEIGHT LOSS program at the KSC Fitness Centers will offer Spaceport employees a chance to make a lifestyle change. Contact Julie Rindfleisch at RindfJE@kscems.ksc.nasa.gov or 867-7829 to sign up.Changing weightsDR. CHARLES SMALLWOOD is the new Joint Base Operations Support Contract (J-BOSC) medical director.STS-107 local and national eventsThere will be a public ceremony to honor all of Americas astronauts who have given their lives in service, including the crew of STS-107, Feb. 1 at 9 a.m. at the Astronaut Memorial Foundation Space Mirror in the KSC Visitor Complex. KSC Director Jim Kennedy and other dignitaries will speak. A tribute to the STS-107 crew produced by CBS Sports will air that night during the pregame television show for the National Football Leagues Super Bowl in Houston, Texas. Crew members for STS-114 will join singer Josh Groban on the field as part of the NFLs salute to NASA. The following day, a Columbia memorial ceremony will be held at 2 p.m. at Arlington Cemetery. NASA TV will broadcast the event.